With just two weeks, planned for my sister to visit me. Her short trip did’nt leave much room for us to travel far from Bangalore. We just returned from Goa and for the Easter weekend decided to drive down to Mysore, about 3 hours drive from Bangalore. It was an early rise and boy-oh-boy it was not easy. It was still dark outside, and I am not a fan of waking up this early. But wake up we must as we had just that day to make sure we saw the magnificent Mysore Palace. We decided to eat breakfast along the way. Kept it very simple and stuck to our idly and masala dosa downed with filter coffee at none other than A2B. Button idlies, there is something about this dish I really love and relish each time someone says breakfast especially on a road trip down south of India. I figured time to just soak in the awesome work of art on the walls. 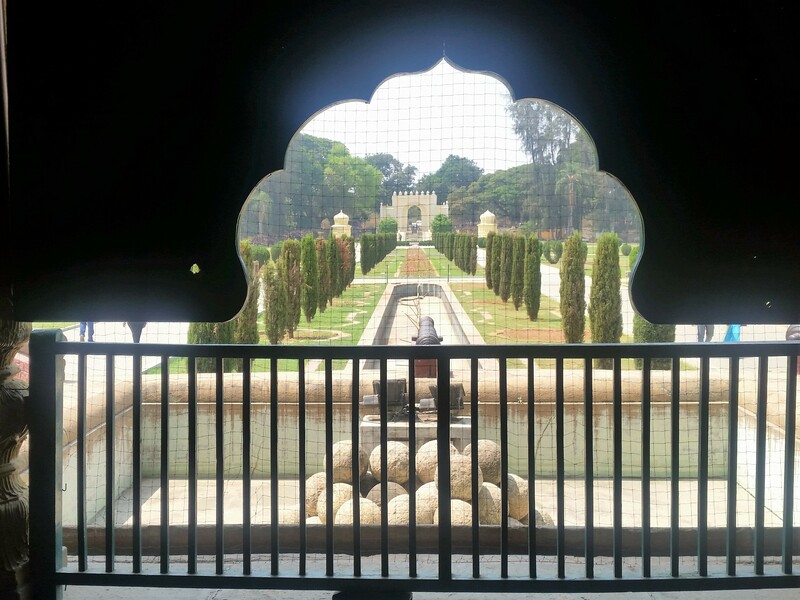 We were allowed to click pictures of the garden from the inside. The Watergate, per history is where the British army entered the fort and had seized Tipu Sultan’s palace and killed him. The history is imprinted with paintings and the silence is very eerie. There is a 3D Painting of Tipu Sultan himself. Its as thou he is watching us no matter which side we walk. Next we drove down to the Gumbaz. 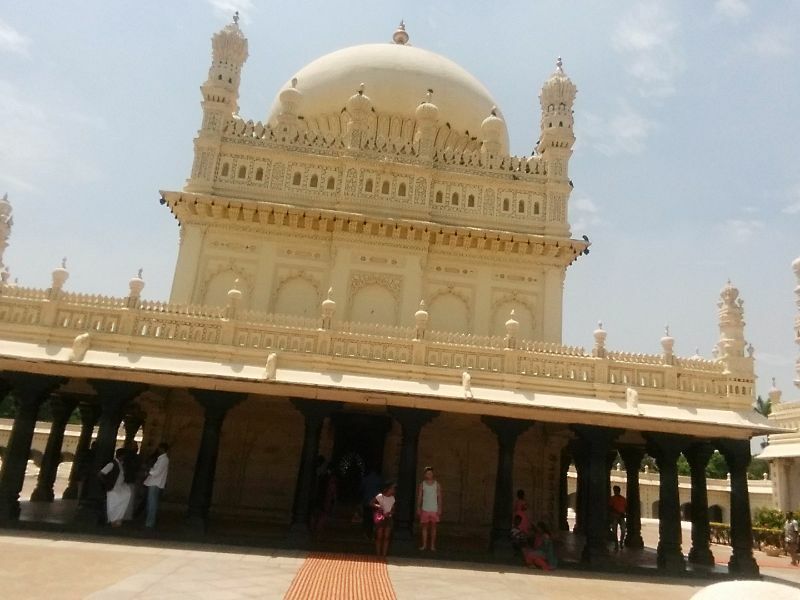 It is the burial chamber of Haider Ali(Tipu’s Father), Fatima Begum (Tipu’s Mother) and Tipu Sultan himself. There are several other tombs of his relatives around. 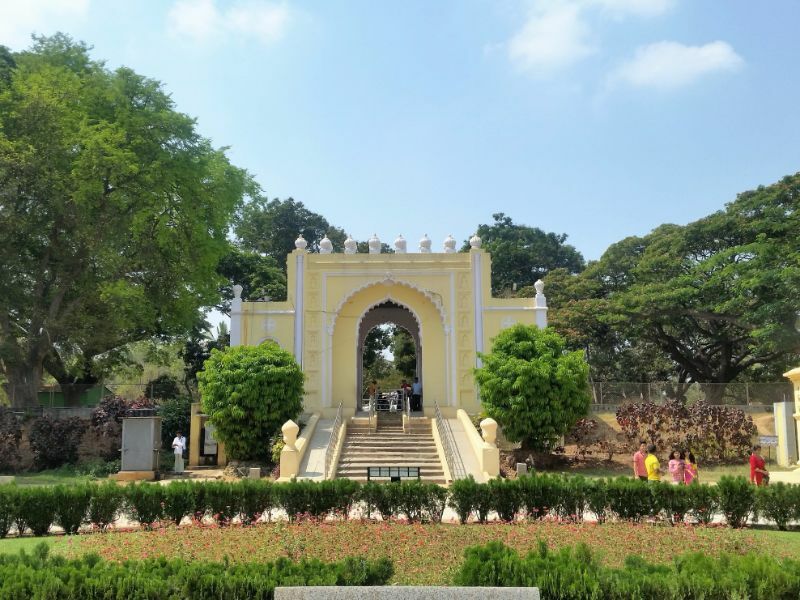 This was constructed by Tipu when he was the King of Mysore, in the midst of Lalbagh Gardern. 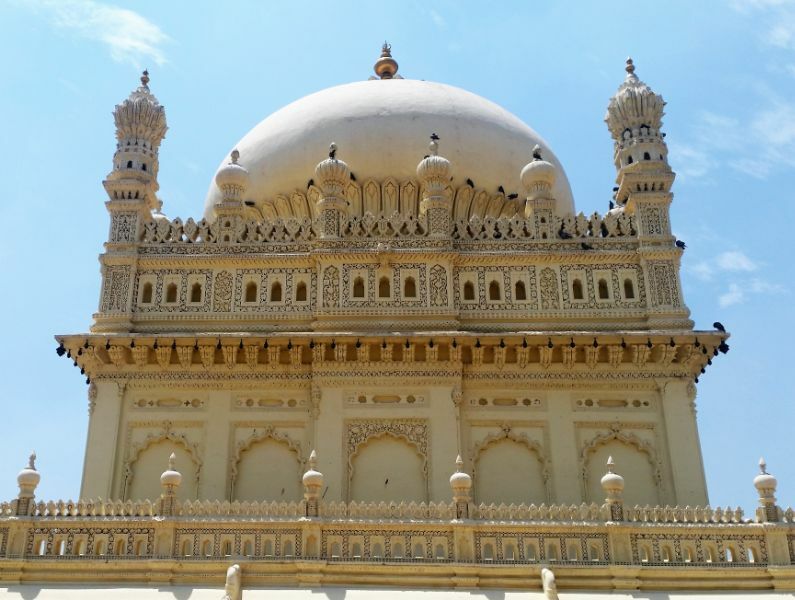 This structure holds a tablet in persian script highlighting the martyrdom of Tipu Sultan back in 1799AD. The 36 pillars signify the 36 glorious years of both Hyder Ali and Tipu Sultan. 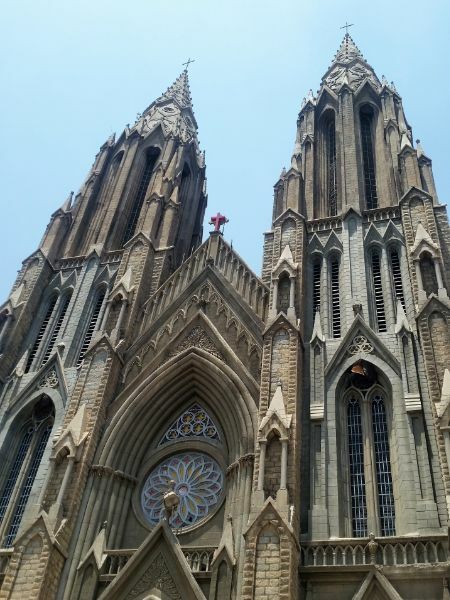 The temperature was soaring, as it was mid afternoon, we decided to drive over the another impressive architecture and one of the oldest and largest churches in India – St. Philomena’s Church. The prominent feature are the two spires and can be seen from a distance. This Neo-gothic style, was built way back in 1843, this was built primarily for the British officers stations at Srirangapatnra and around Mysore. St. Philomena, was was a Grecian Princess , martyred in the 4th century. One of her relics was obtained by Thamboo Chetty, secretary of the Maharaja of Mysore in 1926. Underneath the alter, stairs lead us down below the crypt, sort of like a little chapel called a catacomb where lies the priceless statue of St. Philomena in a reclining position, the preserved relics of the saint along with it. Along the corridor, are names of thousands, that try to tell a story. Walking past this, you emerge back to the outside where the tall structure stands. It is both ironic as well as interesting that his church was built by a French architect, in German Gothic style, for the British soldiers, that was paid for by a Hindu King! By now we were just famished and after a quick lunch we made our way to the infamous Mysore Palace, also the crown jewel of Karnataka. This is the star attraction of Mysore tour. The grandeur of this palace is just breathtaking. Photography is once again strictly not allowed inside the palace. It is such a marvel once you step inside, a grand edifice filled with luxury, as you stroll inside it is just impressive all around. the walls echo a story, and transports you to another era. The tall pillars painted in turquoise, the grand wedding hall three-stories high, the golden throne, chairs of crystal and silver, an unbelievable work of tusks inlaid into wooden doors, gilded decorations in the private Durbar hall(ceremonial meeting halls of the royal ), the grand pillars and marble floors of the public court, an array of canons in the courtyard, exquisite paintings of Dasara procession make up only a small part of the majestic palace. It is highly recommended to travel here over the weekends as the palace is lit up from 7-7:30pm. Unfortunately, we had to drive to Chamundi Hills, so I guess another time to capture the Mysore Palace all lit up! An uphill drive, was just beautiful indeed, as we elevated we could see the city below, the air was cooler. As we arrive the Chamundeshwari Temple. 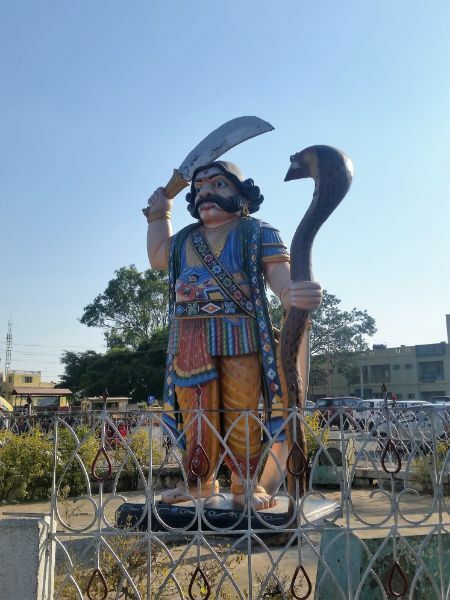 We are greeted by the statue of Mahishasura with a sword in his right hand and cobra in the left is definitely worth clicking a picture. The temple is surrounded by monkeys, so careful with your belongings. During the darshan it gets really crowded, however, when we arrived it was still an hour to go, so we quickly went inside the temple.Next on the agenda was to see the Nandi Statue, which is about 15ft tall. 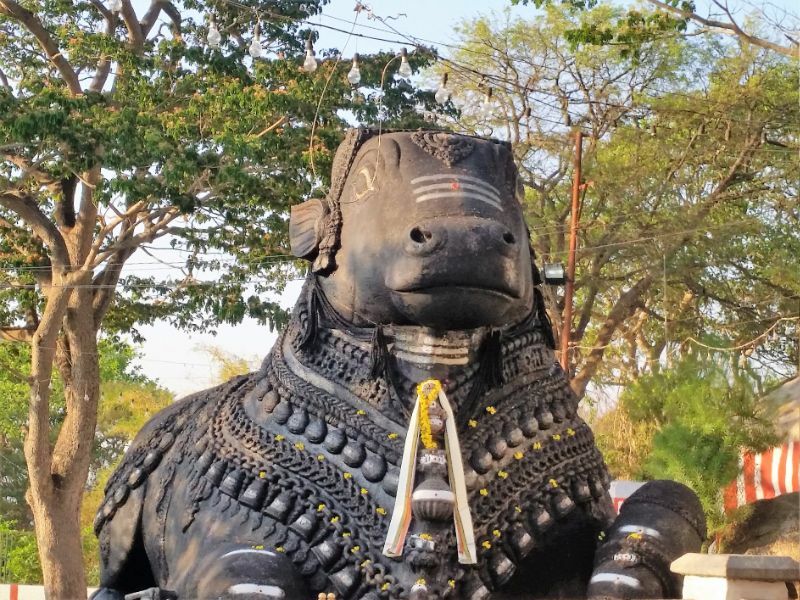 Now, for the extreme fitness folks out there it is worth starting at the bottom of Nandi Statue, as its about 1000 stairs uphill climb to the temple. For us, we took a bit easy way out and walked downhill those 1000 stairs. Throughout the decent we can see the devotion of the devotees, at each footsteps is vermilion(saffron and orange coloured) smeared on the each step and camphor burnt at each step. So with this we decided our lovely day trip much come to a close as it was time for sunset. Overall, it was a real treat. Brindavan Botanical Gardens is also a must and if one can fit this in, along with the Ranganathittu Bird Sanctuary, nothing like it. Always another time, I suppose. Wow! Such a magnificent place, Deena! 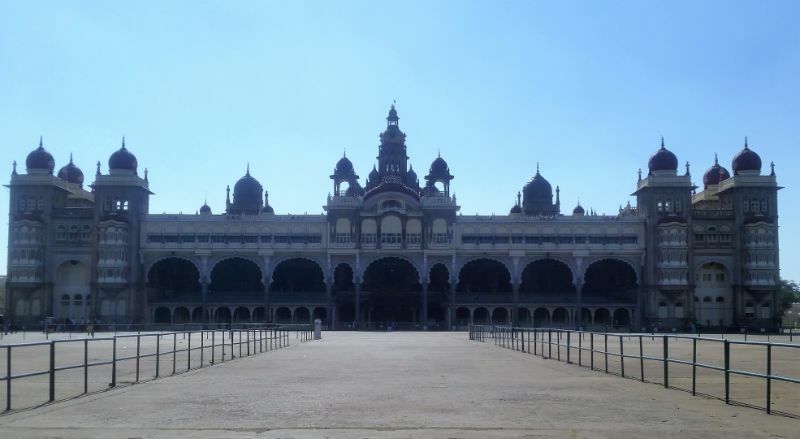 Would you recommend a place to stay at Mysore?